HOME © Muaz Khan . @WebRTCWeb . Github . Latest issues . What's New? MediaStream.stop is obsolete or removed; how to fix it? Or override "getRemoteStreams" and "getLocalStreams"
How to detect if screen-sharing stopped or camera stopped (cross browser)? How to get mp3 stream? How to get mp3 stream using promises? How to check if website already has privileges to access camera/microphone? // check for microphone/camera support! How to manage audio/video bitrates? How to set audio sdp parameters? How to fix Chrome camera/microphone failures? How to detect local or remote stream? How to capture audio+screen in a single getUserMedia request? How to display HTMLVideoElement poster? Maximum peer connections limit is 256. Maximum bandwidth used by each RTP port is 1MB. Only one media source i.e. "APM" is permitted. WebRTC currently uses UDP for RTP transmission. Maximum video bitrate on chrome is about 2Mb/s (i.e. 2000kbits/s). Minimum video bitrate on chrome is .05Mb/s (i.e. 50kbits/s). Starting video bitrate on chrome is .3Mb/s (i.e. 300kbits/s). Each RTP port is using 1 MB bandwidth. It means that 4 MB bandwidth is acquired by each peer. 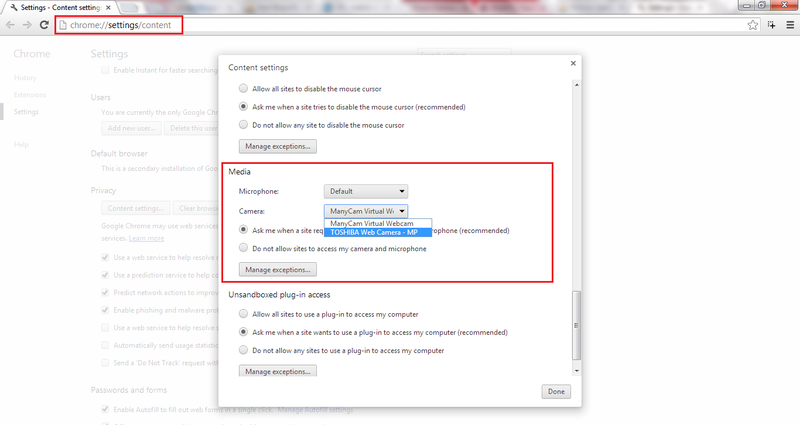 Maximum external video condecs can be used on chrome is 8. Maximum simulcast streams limit is 4. In peer-to-server connection; you can catch DTLS/SRTP (i.e. RTP/RTCP) pacekts as binary-stream. "peer.removeStream" Removes a stream from the PeerConnection. If the stream parameter is absent, removes the stream that was most recently added to the PeerConnection. Opus uses both mono and stereo codecs. Mono bitrate for opus on chrome is 32000 and stereo bitrate is 64000. According to draft "draft-spittka-payload-rtp-opus-03", "Opus bitrate should be in the range between 6000 and 510000", that's why opus min bitrate on chrome is 6000 and max bitrate is 510000. SCTP pacekt max size is 1280. Data max bandwidth is 30720 bps. SampleRate must be in the range 22050 to 96000 (used in RecordRTC). If you're newcomer, newbie or beginner; you're suggested to try RTCMultiConnection.js or DataChannel.js libraries. Enter your email too; if you want "direct" reply!